Spiders and tiger snakes! What have you almost stepped on? Dog poo, sink hole, kids vomit, stingrays! We’ve all almost stepped on something outrageous! 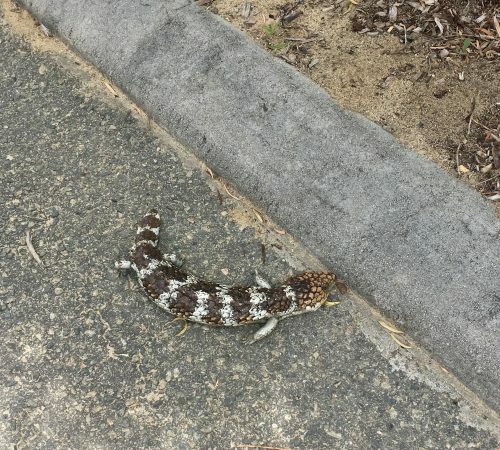 Kirste shared this morning on Brekky that she almost stood on a bobtail lizard over the weekend! Thankfully, she saw it at the last minute. This prompted her to wonder what have you almost stepped on? As it turns out, there are a many people who have almost done the same thing! Aaron almost stepped on a Tiger snake! Esther too. Paul almost squished his newborn baby. Have a listen to the podcast below and hear some great almost stepped on stories.